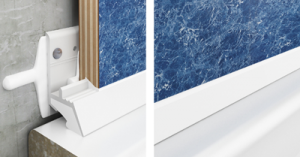 HydroHALT – HydroHALT is an advanced shower tray and bath upstand sealing system that is innovative in design but traditional in its use of proven materials and best practice installation methods. 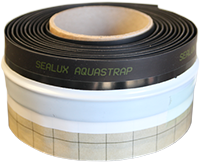 AquaStrap – AquaStrap is a leading ‘Butyl’ based up-stand seal used for sealing a shower tray/pan or bath tub. AquaStrap will remain watertight in the event of the silicone seal leaking through joint movement or natural deterioration. 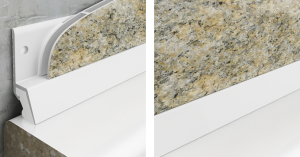 Sealux Profiles – Professional Shower and Bath Seals The sealant is concealed and protected inside the trim while the toothed inner leg acts as a bond-breaker to isolate the silicone from the underside of the outer leg creating flexibility. Trimlux – The sealant is concealed and protected inside the trim while the toothed inner leg acts as a bond-breaker to isolate the silicone from the underside of the outer leg creating flexibility. CLADSEAL – FOR DECORATIVE PVC WALL PANELS – Cladseal shower seals are designed for sealing lightweight PVC wall panels to shower trays and baths. Do wall/ledge joints move ? Why waterproof your shower ? Sealux is pleased to announce the relaunch of www.waterproofingshowers.com, a website designed to provide both diy and professional tilers with easy access to information regarding their product and partner solutions when waterproofing walls over shower trays and baths. A basic technical understanding of what is required to fully waterproof a shower is essential for any consumer wishing to avoid a disaster! Leaking shower tray/bath joint seals and porous shower walls are the two most frequent culprits and these two problems in turn can be most often attributed to the installation of unfit products and installers not following best practice. The website identifies the issues that cause leaks and offers a solution that prevents them. 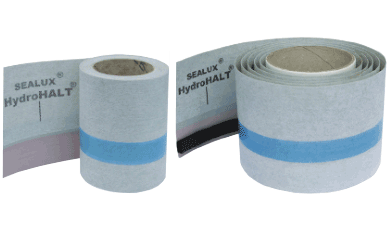 The solution is a product combination from Sealux and BAL that together integrate to provide complete waterproofing over shower trays and baths. We welcome all your comments and questions For technical comments please visit our contact us page. Website comments, email us here please. Trademarks and Copyright © 2019 All text, images and trademarks used on Sealux websites are protected by copyright and trademark laws. No part of Sealux websites may be reproduced without the specific written permission of Sealux. We consider the infringement of Sealux trademarks a serious threat and our policy is to pursue infringers through court of law.